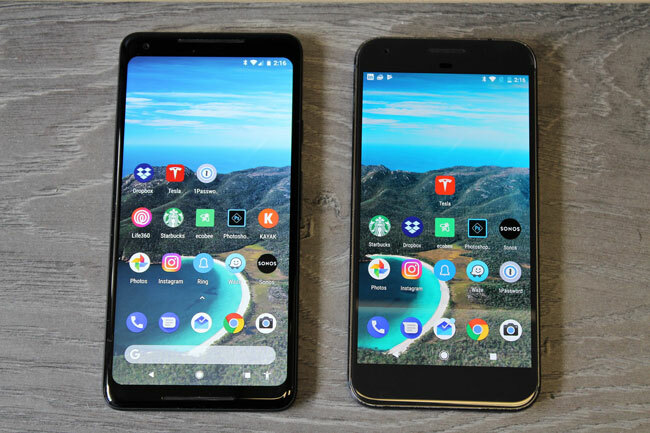 There are enough reviews out there touting the technical specs of the Google Pixel 2 and XL 2. This review aims to give a perspective on the value proposition this phone brings to the table in terms of functionality, ease of use and of course, some cool features that will make you wonder what all the fuss surrounding the iPhone X is. I have been in love with the words “Ok Google” since the purchase of my first pixel XL. They are words I use on average 20 times per day and one that I see increasing over time the more I integrate Google devices into my life. With Google Pixel XL2, I now have more flexibility in how I get my assistant to help me out. I can simply squeeze the sides my phone or long press the home button and my google assistant is there to turn on my flashlight, set my alarm, add to my grocery list or launch an app while I drive without having to look away from the road. As a mom, everyone wants me to remind them of something. I love that I can now squeeze my phone and ask my google assistant to text my husband and remind him to pick up dinner and maybe a bottle of wine. While this is still a work in progress, Google Lens uses google search technology to find information related to the pictures in your gallery. For example, in the image below, I took a picture of the newest edition to my library and as you can see Google Lens analyzed the elements of that image and generated related results that identified the object and provided information on it. This works great with landmarks, artwork and even business cards as it will translate the text in the card into contact info which it then saves to your contacts. Why pay the price for a phone with a ton of storage when you can simply have your google device backup your photos and videos in original quality to the cloud for free? It’s only free at original quality for Pixel users until January 2021 but that’s a long way away when it comes to technology and cloud storage rates are on a steady decline so I wouldn’t stress about that too much. Let’s face it, digital SLR’s are a thing of the past for anyone but professional photographers. Can you think of the last wedding you attended when people started pulling out their SLR’s? Didn’t think so. So when deciding on what phone to buy, you want to ensure quality, consistency and have the camera be feature rich. You will not be disappointed with the camera on the Pixel XL2. Google has opted for a single camera on the Pixel 2 which dual camera fans might be disappointed to hear, but the magic happens in the background with it’s F1.8 aperture and larger pixels. I also loved the bokeh effect that portrait mode now offers in spite of the single lens. The bokeh effect essentially sharpens the main object of the photo and blurs the background. I also loved the processing speed of the camera whereas on the original pixel I used to have to wait a few seconds (first world problems) for the camera to process each image, on the Pixel 2 it appears to be instantaneous. I’m not sure why everyone hasn’t jumped on this bandwagon in terms of placement of the fingerprint sensor. It’s in what I consider the most natural place for ease of use. While the placement hasn’t changed, Google claims that sensor is now the fastest around on the Pixel 2 phones. Phone speakers are not known for providing a great high quality source for listening to your music but I have to say that the sound out of these two speakers included on the Pixel 2 XL sounded pretty fantastic. A definite improvement to the sound from the single speaker on the original pixel. This was a must add feature as far as I’m concerned and pretty self explanatory. Love this feature. My kids are constantly asking me to launch Shazaam to help them identify a song. By the time I log in and get it launched, I’ve often missed the song. With Google’s “always on” three microphone technology, it is constantly listening for any tunes playing nearby and as soon as you lift your phone, it shows you the name of the song with a link to the song in the Google Play Store. Yes, Big Brother-ish indeed but I’ve come to accept that this is our crazy new reality and that my friends, is a whole other article.